Every year, I look forward to the “-ber” months…September-December…for an abundance of reasons. Certainly the end-of-year holidays are wonderful, but more importantly, I simply love Fall. When I was younger, I loved going back to school for all the non-educational reasons: back-to-school clothes, boys I hadn’t seen all summer, football games. So, it should come as no surprise that I REALLY love upcycled Fall decor projects…and I suspect I’m not alone. From pumpkins, to leaves, to acorns and plaid, I get a little charge of seasonal excitement around this time. I live in the South, though, so it won’t start feeling like autumn for a little while yet- but in my mind, it’s already chilly and the humidity has gone away. A girl can dream, right? And based on my social media feeds, I know that lots of you are “ready for Fall” and all things pumpkin spice! 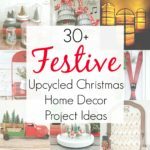 So, I gathered some of my favorite upcycling Fall Decor ideas from bloggers like myself, in hopes of inspiring you to get crafty as the temperature starts to slowly drop. Tell me you aren’t jazzed about autumn craft projects and Fall Decor after seeing these ideas! Whether you see a pumpkin in anything round, an acorn cap inside a bowl, or autumn leaves from the book you’re reading, it’s definitely time to start creating your own DIY upcycled fall decor! And before you go, I hope you’ll check out my entire collection of upcycled Fall Decor projects…and then for later this season, my collection of repurposed Halloween crafts, as well. Thank You for all these suggestions. They are lovely. Thanks so much for pulling these great projects together for us!!! I love the wooden bowls acorns! Been to 3 thrift stores already and haven’t found just the right ones yet…..but I’m on a mission!!! Those acorns really ARE adorable- and the hunt is half the fun!! Sending you good thrifting luck!